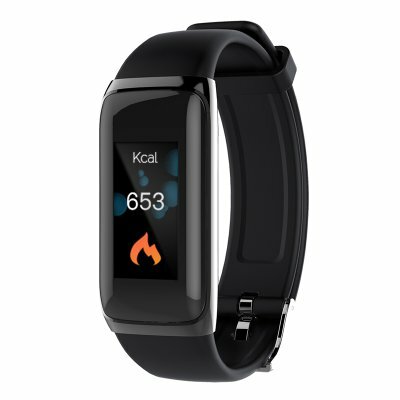 Successfully Added Sports Tracker Bracelet BV22S – Pedometer, Heart Rate, Distant Counter, Calories Burned, Bluetooth, IP67 Waterproof to your Shopping Cart. Accurately keep track of your daily activity levels with the BV22S sports tracker bracelet. This fitness tracker comes with an abundance of health features that motivate you to stay active. With this gizmo at your side, it has never been easier to work towards a healthier future. On its crisp 0.96-Inch OLED display it provides you with detailed information on your daily movement. The sports tracker itself has been crafted out of a soft TPU material thanks to which it is comfortable to wear during the day. If you’re looking for an affordable gadget that motivates you to stay fit, the BV22S fitness tracker is perfect for you. With its pedometer, this sports tracking bracelet allows you to easily keep track of the number of steps you take throughout the day. From now on, you can be assured that you’ll always meet your daily activity levels. Your sports gadget furthermore comes with a sedentary reminder that reminds you to get enough activity during the day. Thanks to an accurate calorie counter, you will now be able to easily see how much energy you have burned during your previous workout sessions. Your sports watch furthermore comes with a distance tracker which exactly shows how many kilometers you have covered. With all these sports and health features at your disposal, you’ll never have an excuse to slack off again. Thanks to a built-in heart rate monitor, you will be able to keep track of your heart rate during upcoming workout sessions. Based on this, you can adjust the intensity of your workouts to make sure you exercise in the most efficient manner. With its IP67 waterproof design, this sports fitness tracker can be used with confidence in any weather condition. You’ll even be able to wear it in the shower or while swimming. Packing a small yet powerful 80mAh battery, your sports bracelet treats you to a whopping 10 days of continuous usage time. This state of the art sports tracking bracelet is compatible with both iOS and Android smartphones through Bluetooth. When connected to your phone, it delivers call and message reminders straight onto your wrist. Thanks to this, you can be assured that you’ll never miss out on an important phone call or message again. This sports watch comes with a 12 months warranty, brought to you by the leader in electronic devices as well as wholesale fitness trackers..